Is Checking Your Money Every Day Making You Sad? If you’re a personal finance geek like me, you probably check your money on a regular basis. Whether that’s weekly, daily or even multiple times per day. Maybe you check your investments, or the stock market, your checking/savings account, credit card balances, mortgage balance, or maybe you even check them all. And financial apps and aggregators only make it easier any second of the day. But beware, checking your money every day could be making you sad! Why? Because we’re not rational people. We experience gains differently than we experience losses, even when it’s the exact same dollar amount. This is called “negativity bias” and if you check your finances too often it can actually hurt you more so than help you. Economists assume that people behave rationally. For a given situation we should be choosing the option that provides us with the most benefit. But that’s not what we actually do. For example, we perceive information differently depending on how it’s presented, which is something called framing bias. If we look back at events and believe that they should have been predictable, then we experience hindsight bias. And if you’re somebody who’s always trying to avoid loss, that gets filed under loss aversion. We’re affected by all sorts of deep, ingrained biases, and each of these affect not only our behavior, but our mood too. We also don’t perceive gain and loss the same way. Which is something called negativity bias. For the same amount of money, we’re affected by losses more so than gains. What does that mean for your personal finances? It means that if you unexpectedly gain $100 one day and then unexpectedly lose $100 the next, you’ll end up feeling sad. Even though you’re in the exact same financial position you were two days ago. The same thing happens when you gain 1% in the stock market and then lose 1% the next day. You’re roughly in the same financial position but you still feel the pain. So Why Do We Keep Looking At Our Investments?!? 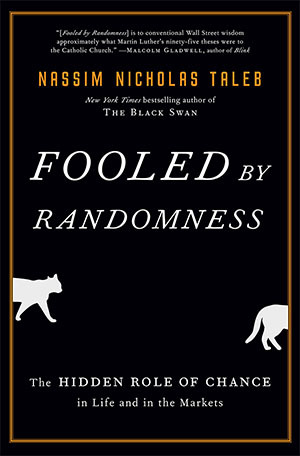 I just read this book called Fooled By Randomness by Nassim Nicholas Taleb. One of the central ideas in his book is that we are terrible at separating noise from signal. Humans seek patterns, even when nothing is there. We want to assign meaning to things even when it’s just randomness. When it comes to the stock market, his point is that day to day, hour to hour, minute to minute, the stock market is mostly noise. It’s speculators making bets on the direction of stock prices based on external factors. 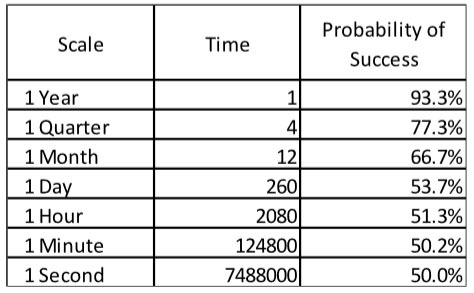 Taleb provides an example: he calculates the chance of a fictional stock gaining when it has an annual growth of 15% and standard deviation of 10% (standard deviation is a measure of the price fluctuations). If you own this stock you only have a 53.1% chance of seeing it gain on any given day. The other 46.9% of the time you’ll see it lose. This is just noise. However, over time this noise gets overcome by actual results. Over a long enough period, the noise is barely noticeable at all. This is why we invest for the long term. If you check this stock on a quarterly basis you’ll have a 77.4% chance of seeing it gain that quarter. It’s even better annually. If you only check this stock once per year you’ll have a 93.3% chance of seeing it gain, almost 19 times out of 20 you’ll have a positive year. That would feel pretty good! 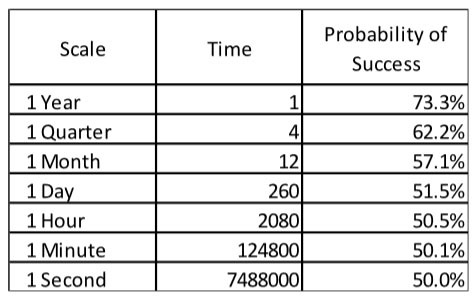 Just for fun I recreated Taleb’s table with the actual results of the S&P 500 over the last 30 years. The compound annual growth rate, including dividends, is 10.5% and the standard deviation is 16.8%. The probability of seeing the S&P 500 gain over one day is just 51.5%. Over a quarter it’s 62.2%. Over one year you have a 73.3% chance of seeing the S&P 500 gain. If you checked the S&P 500 daily you’d lose money nearly half the time! Remember! 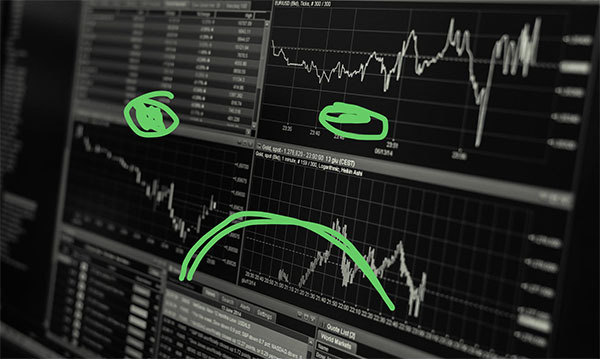 From one day to the next the stock market is mostly noise. But from one year to the next you start to see actual results. By checking your money every day, you open yourself up to these sad feelings. One day your net worth is up, the next day it’s down, and now you feel sad. Nothing has really changed in the market. It’s just random fluctuations. So why do we torture ourselves? Why do we look? In the past this wasn’t a big problem. You got your quarterly account statement from your stock broker in the mail and most times you’d be up. But in the age of financial apps and instant information, it’s easy to get your net worth updated by the second, and that can be dangerous. The question is, does this really matter for you?!? Probably not. Because hopefully you’re still making contributions to your savings and investments on a regular basis. Unless you’re super wealthy, my guess is that your contributions are still larger than those daily fluctuations. Thanks to these contributions, when you check your net worth you’ll see it growing and this can be super motivating. As a financial geek, I get really excited when I see my net worth grow or when dividends come rolling in. This excitement is a very powerful motivator. When should you stop checking your money? Probably when the daily fluctuations start to overcome your contributions. At this point it might makes sense to check your money less frequently. Maybe once per quarter or even once per year. This should help avoid those “sad” feelings. Until then, keep checking your money, just be aware of this psychological trap! Editor’s Note: How often do you all check your accounts? I used to log into my banking EVERY SINGLE DAY because I was obsessed, but now I tend to only look a few times a month just to make sure everything’s kosher. Investments-wise, however, I only check in *once* per month when I sit down to calculate my latest net worth. Which, come to think of it, is probably why I’m always happy each time I run it – the odds are always in my favor! Haha… Yay stats! Owen is an avid traveler, father, and creator of PlanEasy Inc. – a financial planning company and blog sharing weekly tips around personal finance. Find him on Twitter @PlanEasyCanada, or in person the next time you’re in London, Ontario!